Pipe cleaners are an easy-to-work-with craft supply that can be bent into almost any shape you desire. Use just five of these fuzzy wires to create a miniature elephant. With a few spirals and a little shaping, you can create a three-dimensional elephant to display on your desk or play with as a moveable toy. Select pipe cleaners in typical elephant colors, such as gray or blue, or create a one-of-a-kind elephant using pink, purple or red wires. Wrap a pipe cleaner around a thick marker to create the elephant's body. The thicker the marker, the fatter the elephant will be. Coil the pipe cleaner end to end around the body of the marker, keeping the coils touching with each loop. Slide the coiled pipe cleaner off one end of the marker. Straighten out one end of the coil to represent the creature's tail. Wrap another piece of pipe cleaner around a thinner marker or pencil to create the elephant's head. Loop about half the pipe cleaner around the marker, leaving the other half uncoiled. Shape the uncoiled part into a curve to make the elephant's trunk. Cut a piece of pipe cleaner into two 1-inch pieces. Curve the material into a "C" shape to make the elephant's ears. 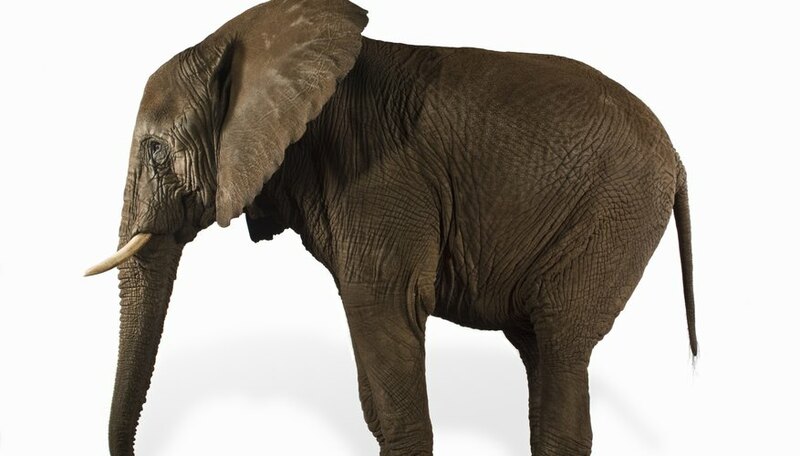 Attach these pieces to the sides of the elephant's head by making a small bend at the top of each ear. Hook the bend around one side of the coil of the elephant's head and pinch it in place. Repeat on the other side with the other ear. Snip two pipe cleaners in half with a scissors. Wrap each of the four pieces around a pencil or marker to shape the animal's legs. Slide the coils off. Make a small hook at the top of each leg. Wrap each one of the leg hooks around a coil on the underside of the elephant's body and pinch them in place. Use white glue to attach two googly eyes to the face of the elephant.